This afternoon, Saturday, March 3, 2018, Military Sealift Command hospital ship USNS Mercy (T-AH 19) arrived at Joint Base Pearl Harbor-Hickam Hawai‘i, while en route for Pacific Partnership 2018. 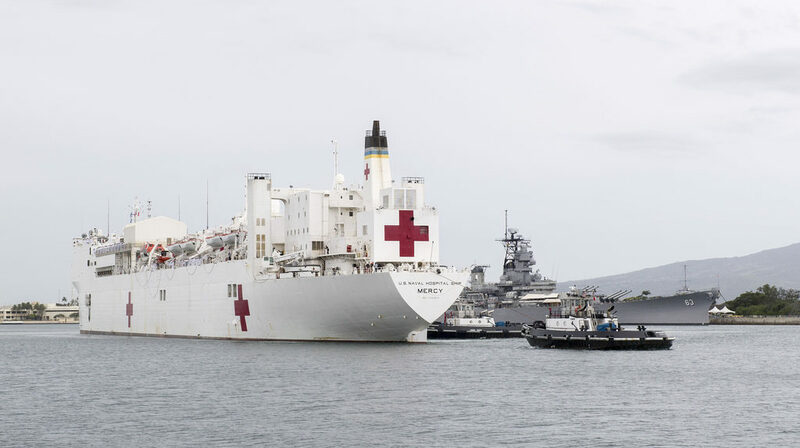 During the visit, Pacific Partnership personnel will work side-by-side with local medical professionals to promote the mission, conducting routine maintenance, and load additional supplies onto the ship. During Pacific Partnership, Mercy and Military Sealift Command expeditionary fast transport USNS Fall River (T-EPF 4), the U.S. ships participating in this year’s mission, will visit different Indo-Pacific nations, increasing the reach and scope of the mission’s participants and host nation counterparts to conduct technical expertise exchanges in medical, engineering, and humanitarian assistance and disaster relief (HA/DR). Additionally, key leader and community engagement events will allow for direct engagement with local citizens and enhanced relationships with partner nation military and government leadership. Pacific Partnership, now in its 13th iteration, is the largest annual multilateral HA/DR preparedness mission conducted in the Indo-Pacific. The mission’s objective is to enhance regional coordination in areas such as medical readiness and preparedness for man-made and natural disasters. Pacific Partnership 2018 consists of more than 500 U.S. military personnel stationed worldwide, working side-by-side with host nation counterparts to be better prepared for potential humanitarian aid and disaster response situations. Crew members assigned to the “Fighting Tigers” of Patrol Squadron Eight (VP) 8 rescued three fishermen Feb. 20 whose vessel was adrift in the South Pacific for eight days. The 19-foot skiff was first reported missing Feb. 12 after it failed to return from a fishing expedition near Chuuk Lagoon in the Federated States of Micronesia. According to the report, the boat carried food and water, but no safety equipment or radios. Assets from U.S. Coast Guard Sector Guam searched for the vessel for several days before requesting assistance from the U.S. Navy. The VP-8 aircrew and maintenance team were tasked to support the search and rescue (SAR) operation, repositioning on short notice from Kadena Air Base, Japan, to Andersen Air Force Base. The crew flew the Navy’s newest maritime patrol aircraft, the P-8A Poseidon, which is equipped with an advanced APY-10 multifunction radar and MX-20 camera system, ideal for searching the 2,100-square-mile area. The vessel was located after only three hours and the aircrew deployed a UNI-PAC II search and rescue (SAR) kit, a new addition to the maritime patrol and reconnaissance aircraft (MPRA) fleet and the first time the kit had been successfully deployed by a P-8A in real-world SAR operations. SAR kits are deployed at approximately 500 feet with a 150 yard trailing lanyard to deliver equipment as accurately as possible to survivors in the water. Kits generally include medical supplies, food, water, communications, and signaling equipment, but can be configured with additional supplies depending on the mission type. The three survivors were picked up by a nearby police vessel a few hours after being located by VP-8. VP-8 is deployed to the U.S. 7th Fleet area of area of operations conducting theater and national level tasking. “On 30 October 2017, Admiral William Moran, Vice Chief of Naval Operations, designated Admiral Frank Caldwell as the Consolidated Disposition Authority to review the accountability actions taken to date in relation to USS Fitzgerald (DDG 62) and USS John S. McCain (DDG 56) collisions and to take additional administrative or disciplinary actions as appropriate. After careful deliberation, today Admiral Frank Caldwell announced that Uniform Code of Military Justice (UCMJ) charges are being preferred against individual service members in relation to the collisions. USS Fitzgerald: Courts-martial proceedings/Article 32 hearings are being convened to review evidence supporting possible criminal charges against Fitzgerald members. The members’ ranks include one Commander (the Commanding Officer), two Lieutenants, and one Lieutenant Junior Grade. The charges include dereliction of duty, hazarding a vessel, and negligent homicide. USS John S. McCain: Additionally, for John S. McCain, one court- martial proceeding/Article 32 hearing is being convened to review evidence supporting possible criminal charges against one Commander (the Commanding Officer). The charges include dereliction of duty, hazarding a vessel, and negligent homicide. Also, one charge of dereliction of duty was preferred and is pending referral to a forum for a Chief Petty Officer. The announcement of an Article 32 hearing and referral to a court-martial is not intended to and does not reflect a determination of guilt or innocence related to any offenses. All individuals alleged to have committed misconduct are entitled to a presumption of innocence. Additional administrative actions are being conducted for members of both crews including non-judicial punishment for four Fitzgerald and four John S. McCain crewmembers. 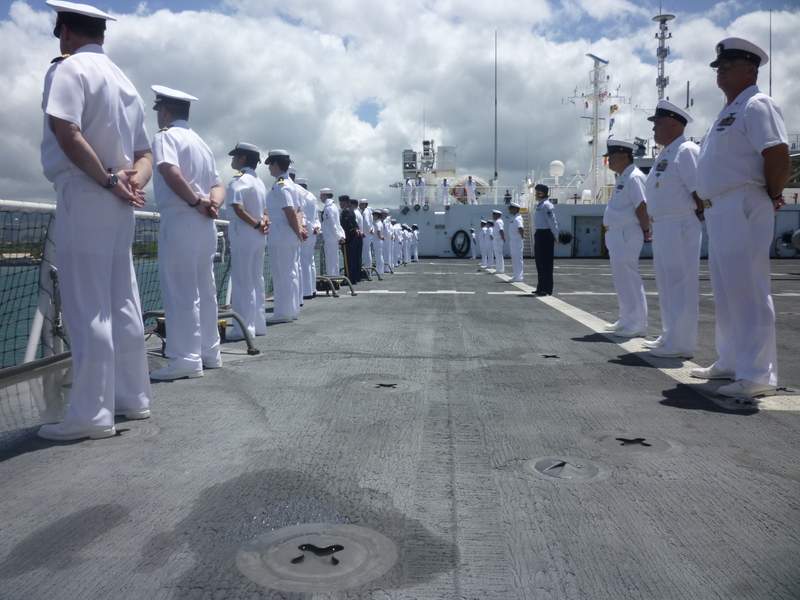 The crew of Coast Guard Cutter Oliver Berry (WPC 1124), a 154-foot Fast Response Cutter homeported in Honolulu, recently completed a 10-day patrol of the U.S. Exclusive Economic Zone in the Hawaiian Islands region. They conducted six boardings on Hawaii-based, U.S.-flagged long-line fishing vessels and issued eight safety and fisheries regulations violations. “Oliver Berry is ideally suited for challenging offshore conditions in the Main Hawaiian Islands. The crew performed admirably in the heavy seas we encountered and when launching and recovering our standardized small boats from the stern to conduct boardings. We are specifically designed for several missions including search and rescue and fisheries enforcement. We greatly improve the Coast Guard’s on water presence with more range and operational hours over our predecessor, the 110-foot patrol boats,” said Lt. Kenneth Franklin, commanding officer, Oliver Berry. Oliver Berry’s crew enforced fishery regulations in the region, to ensure the estimated $7 billion industry, which provides more than half of the global tuna commercial catch, remains sustainable. Boarding teams also ensured crews are in compliance with federal and state regulations regarding all required lifesaving equipment. Citations were issued when applicable, requiring master’s to correct discrepancies. This is a critical role in the Coast Guard’s mission to preserve a natural resource, highly migratory fish stocks, essential to the fishermen and economy of not only the United States, but many Pacific nations. On Dec. 19, while conducting a boarding of a U.S.-flagged longline fishing vessel, the boarding team suspected a foreign national was acting as the vessel captain and operating the vessel. The operation of a U.S.-flagged commercial fishing vessel by a foreign national is illegal. After an investigation, the vessel was cited for the alleged manning violation also known as a paper captain and the evidence was forwarded to the Coast Guard Hearing Office for further review and possible legal action. The penalty for operating with a paper captain once their documentation has been voided is a civil fine of up to $15,000 per day. 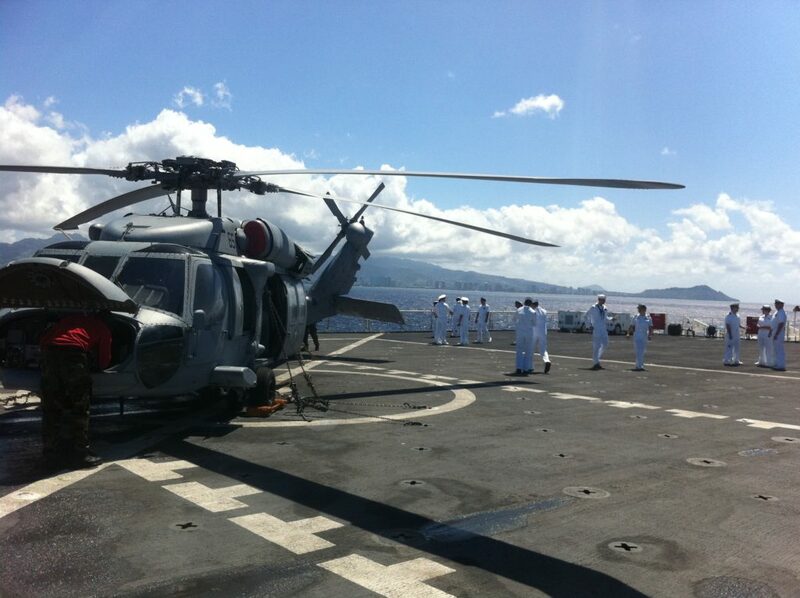 The Oliver Berry crew also hosted several members of the Hawaii County government and the Hilo-based Navy League during a port visit in Hilo. The crew showcased the capabilities of the cutter’s 26-foot over-the-horizon small boat and advanced command and control electronics to demonstrate how the newest Fast Response Cutter will benefit Hawaii County, while based in Honolulu. “We all enjoyed engaging with our local government partners in Hilo and explaining how our cutter can assist in future search and rescue or law enforcement cases near the Big Island. Our goal is always to build stronger relationships between all our partners throughout the state,” said Lt. j.g. Peter Driscoll, executive officer, Cutter Oliver Berry. Oliver Berry is designed for multiple missions, including law enforcement and search and rescue. Oliver Berry has advanced seakeeping abilities and can achieve speeds in excess of 28 knots, with an endurance of five days. For more information about Oliver Berry, please contact District 14 Public Affairs at 808-535-3230 or Oliver Berry’s public affairs officer at Peter.M.Driscoll@uscg.mil. The grounded Pacific Paradise was successfully removed from the reef off Kaimana Beach Thursday. The State of Hawaii’s Department of Land and Natural Resources will assume the lead as the coordinating agency to work with the owner of the Pacific Paradise to conduct cleanup of the wreck site as the pollution threat has been removed. The state will assess any damage done to the reef and facilitate the next step in mitigating the impacts and rehabilitating the reef. Response crews refloated the Pacific Paradise Wednesday and moved the vessel about 600 feet into the sandy channel before losing the tide. Crews conducted additional work to the vessel late in the day to prepare for the refloat and tow Thursday. That effort was ultimately successful in fully removing the vessel at 7:15 a.m. on the high tide using the tug Pi’ilani. Just over a mile offshore the tow was switched over to the tug American Contender for the transit out to the EPA-approved disposal site 13 miles south of Oahu in federal waters. The responders are now in the process of sinking the Pacific Paradise in nearly 1,800 feet of water, which may take several hours. During the operation to refloat and remove the grounded vessel minimal pollution entered the water. The vessel originally grounded just before midnight Oct. 10. In the time since, local and mainland experts have worked diligently to remove the vessel as quickly and safely as possible with the least amount of impact to the marine environment. Responders spent the past weeks preparing and patching the hull, removing excess weight by pumping water and removing heavy spare parts including sheet metal and the rudder and adding additional buoyancy. The challenging environment and weather did slow or delay some work. The Coast Guard is continuing the investigation into the cause of the grounding. That process will likely take several months. Once complete those findings will be released to the public and action will be taken to levee any fines or punitive actions that may be deemed appropriate. The guided-missile cruiser USS Lake Erie (CG 70) arrived in Pearl Harbor, Nov. 30, following a seven-month deployment to the Indo-Asia-Pacific region and the Arabian Gulf. Lake Erie left her homeport of San Diego in May on an independent deployment with an embarked detachment from Helicopter Maritime Strike Squadron (HSM) 49. The ship and her crew sailed more than 40,000 miles during the deployment. Sailors provided humanitarian assistance in Colombo, Sri Lanka, after severe flooding and landslides devastated many regions of the country and left 10,000 homeless. The crew also provided support to Operation Inherent Resolve in the Arabian Gulf and conducted training and operations with foreign navies including the Royal Australian Navy. Lake Erie served as the Nimitz Strike Group ballistic missile defense commander (BMDC) in addition to the other missions traditionally performed by a cruiser or destroyer. Throughout her deployment, Lake Erie carried out two transits of the Strait of Malacca, 13 escorts of Military Sealift Command and U.S. flagged cargo and support vessels through the Strait of Hormuz; executed more than 20 restricted water navigation details and conducted more than 20 underway replenishments safely receiving over 4 million gallons of diesel fuel and 89,000 gallons of jet propulsion fuel with zero mishaps. Lake Erie also performed a national tasking BMD mission in the Western Pacific as part of a joint task force. Lake Erie visited various ports during deployment, including Pearl Harbor; Singapore; Colombo, Sri Lanka; Abu Dhabi, United Arab Emirates; Manama, Bahrain; Dubai, United Arab Emirates; Hamad, Qatar; Subic Bay, Philippines; and Guam. Sailors participated in numerous volunteer events, including interacting with children at schools, visiting patients at hospitals, and socializing with animals at shelters. During deployment, 116 Sailors qualified as enlisted air warfare specialists, 84 Sailors qualified enlisted surface warfare specialists, 113 Sailors advanced to the next rank, 32 Sailors reenlisted, and 40 Sailors enrolled in college classes. Crew members earned more than 150 awards, including six Sailors whom received Army Achievement Medals for their bravery during a medical evacuation. Lake Erie is part of Nimitz Strike Group and operates under U.S. 3rd Fleet, which leads naval forces in the Pacific and provides the realistic, relevant training necessary for an effective global Navy. U.S. 3rd Fleet constantly coordinates with U.S. 7th Fleet to plan and execute missions based on their complementary strengths to promote ongoing peace, security, and stability throughout the entire Pacific theater of operations. Search and rescue operations continue for three personnel following a C-2A Greyhound aircraft crash southeast of Okinawa at 2:45 p.m. today. A United States Navy aircraft carrying 11 crew and passengers crashed into the ocean southeast of Okinawa at approximately 2:45 p.m. today. Personnel recovery is underway and their condition will be evaluated by USS Ronald Reagan medical staff. The aircraft was en-route to the U.S. Navy aircraft carrier USS Ronald Reagan (CVN 76), which is currently operating in the Philippine Sea. The crew of the Los Angeles-class fast-attack submarine USS Olympia (SSN 717) returned to Joint Base Pearl Harbor-Hickam following the successful completion of a Western Pacific deployment, Nov. 9. Olympia participated in several coordinated exercises with U.S. and allied forces and completed three highly successful missions vital to national security. The deployment was a great opportunity for junior Sailors to gain vital operational experience and to hone guidance and leadership skills from the senior leadership. “The sincere efforts by our experienced submariners instilling qualities that every Sailor needs to be successful and safe helped the junior Sailors become more knowledgeable and helpful in the execution of ship’s operations,” said Master Chief Electronics Technician Submarine, Navigation Roland R. Midgett, chief of the boat and native of Virginia Beach, Virginia. During the deployment, Olympia advanced 16 enlisted Sailors to the next rank, promoted seven officers and saw 37 submariners earn the right wear the Submarine Warfare device. Between missions, Olympia enjoyed four port calls to Guam and Japan. “Having the opportunity to visit Japan on two separate occasions was an unforgettable experience,” said Machinist’s Mate (Weapons) Fireman Raul Bonilla, a native of San Diego. The return of the Olympia to Pearl Harbor marks nearly 33 years of commissioned service since November 17, 1984. Olympia is the second ship of the Navy to be named after Olympia, Washington. Olympia is the 29th ship of the Los Angeles-class fast-attack submarines. The submarine is 362-feet long, displaces 6,900 tons and can be armed with sophisticated Mark-48 torpedoes and Tomahawk cruise missiles. The USS Ronald Reagan (CVN 76), USS Nimitz (CVN 68), and USS Theodore Roosevelt (CVN 71) strike groups will commence a three-carrier strike force exercise in the Western Pacific, Nov 11-14. Units assigned to the strike force will conduct coordinated operations in international waters in order to demonstrate the U.S. Navy’s unique capability to operate multiple carrier strike groups as a coordinated strike force effort. While at sea, the strike force plans to conduct air defense drills, sea surveillance, replenishments at sea, defensive air combat training, close-in coordinated maneuvers, and other training. This is the first time that three carrier strike groups have operated together in the Western Pacific since exercises Valiant Shield 2006 and 2007 off the coast of Guam. Both exercises focused on the ability to rapidly bring together forces from three strike groups in response to any regional situation. Ronald Reagan took part in VS 2006 and Nimitz took part in VS 2007. More recently, U.S. Navy aircraft carriers have conducted dual carrier strike group operations in the Western Pacific including in the South China Sea, East China Sea and Philippine Sea. These opportunities typically occur when strike groups deployed to the 7th Fleet area of operations from the West Coast of the United States are joined with the forward deployed carrier strike group from Japan. Military convoy from Kawihae Harbor to Pōhakuloa Training Area. U.S. Army Garrison-Hawai’i photo. 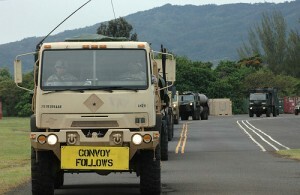 Soldiers and Marines are scheduled to convoy from Kawaihae Docks to Pōhakuloa Training Area (PTA) on Friday, Nov. 3. The convoys are scheduled to start at noon and finish by 3:30 p.m. The convoy will be escorted by marked vehicles with rotating amber lights and signs. Motorists are asked to be on alert and drive with care around convoy vehicles. For more information, contact the US Army Garrison-Pohakuloa Public Affairs Officer, Eric Hamilton, via email eric.m.hamilton6.civ@mail.mil or by phone to either (808) 969-2411 or (808) 824-1474. 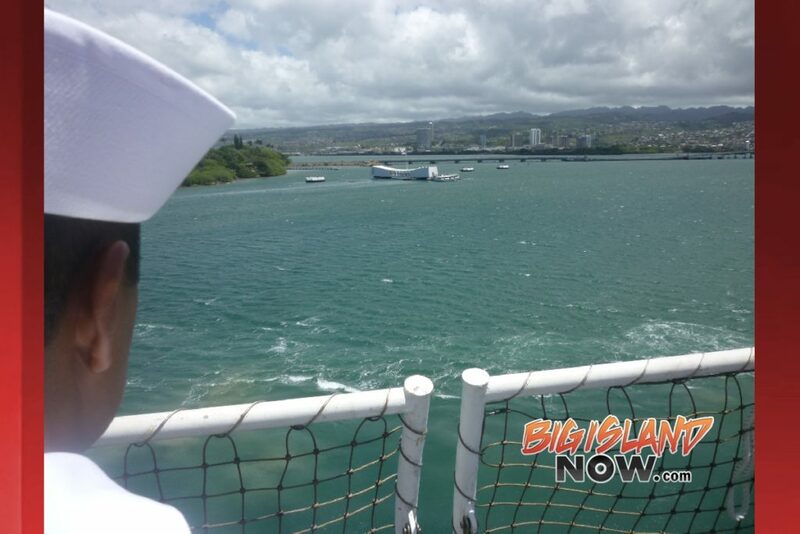 The Coast Guard Cutter Oliver Berry (WPC 1124), Hawaii’s first Sentinel-class cutter, was commissioned into service at Coast Guard Base Honolulu, Tuesday. Vice Adm. Fred M. Midgette, commander, Coast Guard Pacific Area, presided over the ceremony accepting the first of three 154-foot fast response cutters to be stationed in Hawaii. The cutter’s sponsor Susan Hansen, who is a distant cousin of Oliver Berry was also in attendance for the ceremony. The Oliver Berry is the first of three Honolulu-based FRCs that will primarily serve the main Hawaiian Islands. The cutter is named after Chief Petty Officer Oliver Fuller Berry, a South Carolina native and graduate of the Citadel. He was a highly skilled helicopter mechanic working on early Coast Guard aircraft. Berry was also one of the world’s first experts on the maintenance of helicopters and served as lead instructor at the first military helicopter training unit, the Rotary Wing Development Unit which was established at Coast Guard Air Station Elizabeth City, North Carolina, in 1946. He also helped develop the helicopter rescue hoist. Berry had an extensive career spanning much of the globe. He was involved in a helicopter rescue out of Newfoundland that earned him a commendation and the Belgian Silver Medal of the Order of Leopold II. In this case, Berry was able to quickly disassemble a helicopter in Brooklyn, New York, which was then flown to Gander, Newfoundland, in a cargo plane where he then reassembled it in time for the rescue crew to find and save 18 survivors of a crash aboard a Belgian Sabena DC-4 commercial airliner. The Coast Guard is acquiring 58 FRCs to replace the 110-foot Island-class patrol boats. The FRCs are designed for missions including search and rescue; fisheries enforcement; drug and migrant interdiction; ports, waterways and coastal security; and national defense. 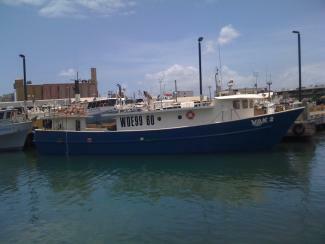 The Coast Guard took delivery of Oliver Berry June 27 in Key West. The crew then transited more than 8,400 miles (7,300 nautical miles) to Hawaii. The cutters are designed to patrol coastal regions and feature advanced command, control, communications, computers, intelligence, surveillance and reconnaissance equipment, including the ability to launch and recover standardized small boats from the stern. There will be three fast response cutters stationed here at Base Honolulu by the spring of 2019. These cutters with their improved effectiveness in search and rescue will make the waters around the main Hawaiian Islands a much safer place for recreational boaters and users of the waterway. They greatly improve our on water presence with each providing over 7,500 operational hours, a 40 percent increase over the 110-foot patrol boats.